Walk the beat, conduct patrols and complete missions with confidence and style while wearing the 60/40 Cotton Polyester Twill BDU Pants from Tru-Spec. 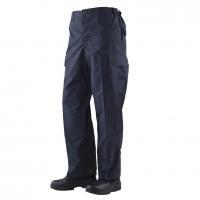 Built to military specifications and constructed from a uniquely breathable textile, these pants offer all day comfort as well as lasting protection. The seat and knees are reinforced to handle the stress of frequent and intense physical activity without tearing or coming undone. An ergonomic six-pocket layout offers ample storage space for carrying all the equipment needed to get the job done right. Billowed cargo pockets carry larger items while front slash pockets are perfect for securing knives, flashlights and other items. The two rear pockets include snap proof flaps to keep contents secure without getting stuck on seats or anything else. The quality of the BDU exceeded my expectations. Very good quality for the price - they should last me a long time. As described and well made. Will purchase again. Excellent product. I love them super comfy. Fit like a dream.